The other day I went for a root around to see if I could find all my soft plastics that were rigged on various weedless hooks. Blame the awful weather and the worst dose of cabin fever I have ever known, but I thought it might be useful to check the hooks for rust and blunt points etc. Now I do use a lot more soft plastics than I ever used to, but holy cow I reckon I had to have had nearly thirty separate soft plastics pre-rigged on various weedless hooks - and that’s not counting Fiiish Black Minnows, Savage Gear Sandeels, and various other paddletails rigged on jig heads. Is that normal? Haven’t got a clue and to be honest I have never really cared, but over the course of last season I guess I rigged up a lot of soft plastics! My pre-rigged collection consisted mainly of DoLive Sticks in a bunch of different colours (I hadn’t quite realised how many of the white ones I had rigged up! ), white senkos, a couple of those Albie Snax, and then a few 4.5” OSP DoLive Shads and some MegaBass Spindle Worms rigged on belly-weighted weedless hooks. Obviously I don’t take that many lures out fishing with me at one go, but it kinda surprised me how things built up. Anyway, so I checked hooks and then checked most of the soft plastics for damage (gotta love Mend-It or the rather good and more easily available Savage Gear “Fix-It” equivalent, takes a bit longer to dry, but works great) - and what struck me was that it was a lot of weedless hooks sitting in a lot of lures! 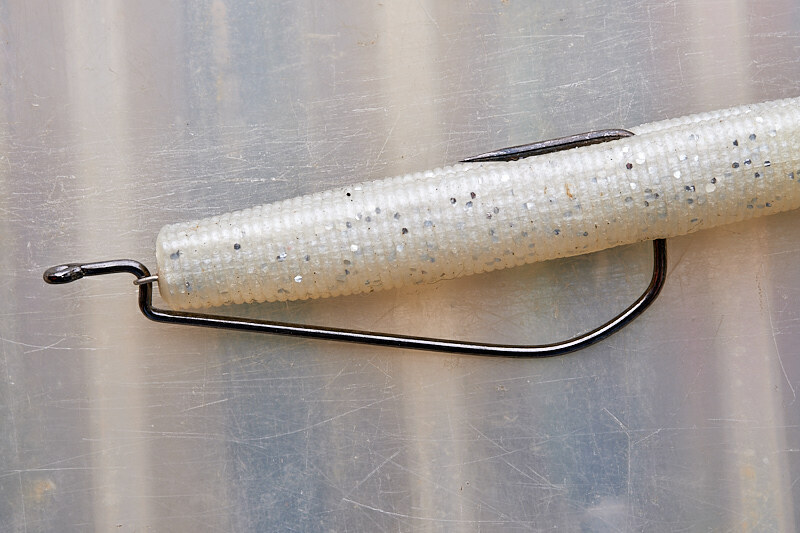 Now I don’t know about you, but almost ever since I first started really getting into soft plastics that I’d rig weedless, the hitch-hiker way of rigging them made perfect sense from the moment I stumbled upon it. That little metal coil thing that is attached to a specialist shape of weedless hook and screws into the front of a soft lure is a complete no-brainer in my opinion - my soft plastics last far longer, they don’t tear off nearly so easily on a fish, and I think they are consistently easier to rig like this. There are plenty of these hitch-hiker style weedless hooks out there now, but my out and out favourite for a good while now has been the Owner Twistlock weedless hooks (Gary Yamamoto spec) - I mainly use the 5/0 size with a 6’’ OSP DoLive Stick and then vary the size accordingly depending on what lure I am using. These hooks are not that cheap, but for me they work perfectly, and as I said, the hitch-hiker system of rigging makes so much sense. Note above how the shape of the Owner hook directly below the eye is slightly different to the regular weedless hook below that isn’t designed to be used with a hitch-hiker. Or so I thought………………….. Damn it all makes perfect sense now, but when I first found this out on Friday I had one initial thought straight away - do all anglers who fish with soft plastics realise this and am I the only eejut who doesn’t? So I did what I often do and asked the question on my Facebook page - and it became very apparent very quickly that most anglers who kindly replied didn’t know this either. If you use any weedless hooks that come with a hitch-hiker coil attached to them, you will notice that they are all of a similar design to the Owner Twistlock one that I happen to really like. The first time I stumbled upon rigging soft plastics like this was actually via the Mustad hook above - and they are a brilliant hook - but all the hooks which have hitch-hiker coils on them that I have come across over the last few years (unweighted and with belly-weights on) have that “sloping” design below the eye of the hook to allow for the hitch-hiker and how it works. But have you ever seen those packets of hitch-hiker coils that you can buy? Are you in the same boat as me in that you wondered what the point of them was because they didn’t work with regular weedless hooks? I don’t know how much you read product descriptions, but aside from tracking down those particular Mustad weedless hooks and then buying packets of hitch-hikers to go with them (which I have done I might add, the exact name is “Mustad 91768BLN”, but I had to buy the hooks in the US when I was over there, or you can buy some sizes of them here in the UK with hitch-hikers already attached), the descriptions of how to use these hitch-hiker coils are at best vague. Think about the design of a regular weedless hook and then ask yourself how on earth a hitch-hiker is meant to clip in there like it does on a specialist hook that’s been designed to work with them. It doesn’t work. But in fact it does, but I only found out on Friday when I was having a cup of coffee and “researching” some YouTube fishing videos and I stumbled upon the one above which I initially started watching because of how bloody difficult skip-casting was to learn when I have had to do it (not very well) abroad! And then at 3:34 in the video it gets to almost a throwaway, here’s how I rig my soft plastic bit of footage, and lo and bloody behold if the Ozzie angler isn’t rigging his lure on a hitch-hiker and onto a regular shaped weedless hook. And the lightbulb goes off in my head, albeit with that caveat - surely I can’t be the only angler not to have realised that you can rig a soft plastic like this, as per above? Thankfully it seems not, but damn it’s so bloody simple I can’t for the life of me think why I never realised this before! It’s not as if I suddenly need to change my way of doing things with those Owner Twistlock hooks especially, but as ever I do like to have different options, and I happen to have a fair few regular weedless hooks here that I really like but have stopped bass fishing with because I couldn’t use a hitch-hiker on them to rig my soft plastics, or so I previously thought. But I can now. I have blogged about the outstanding Lunker City Texposer weedless hook before (especially the 5/0 for my senkos etc.) and how they just never seem to show any signs of rust, and for years now I have loved those “Varivas Gran Hooking Master” weedless hooks, and especially the “Monster Class” ones (I can dream!). My go-to weedless hook for wrasse is this particular Varivas hook in the 1/0 to 3/0 sizes, but for bass I also really like the bigger 4/0, 5/0 and 6/0 (you can also get them in a whopping 10/0) - yet I stopped using them because I couldn’t rig my soft plastics on a hitch-hiker. Do you need to do it like this? Of course not, but I prefer to, I have got used to it, and I gave up making allowances for hooks that wouldn’t work how I wanted them to. But they all do now, and yet again I say damn, how simple is this! You can go searching around for hitch-hiker coils, but I happen to prefer the Owner ones (actually called Owner CPS Centering Pin Spring) because of that centering pin as per above on the left and how easily it is to properly line a soft plastic up and screw it onto them. Now it’s all well and good that various Owner weedless hooks come with these particular hitch-hiker coils already attached, but I want to buy them separately now to use on regular weedless hooks - and you can, indeed I have done so in the past, but as is annoyingly typical with too many specialist items of fishing tackle like this, I can’t find them for sale in the UK. When I bought some to go with those specialist Mustad weedless hooks, I had to get the Owner hitch-hikers when I was in the US, along with the hooks. So I went looking on Friday once the lightbulb had gone off in my head and I found that the new Seadra brand from the excellent Veals Mail Order people had essentially “borrowed” the exact design - check here. Copying it may well be, but I far prefer this style of hitch-hiker clip and I’d far rather buy small and cheap items of fishing tackle like this directly from the UK. And of course - through gritted teeth - it’s a huge well done to Wales on the Grand Slam and their utter demolition of Ireland, and I don’t quite know what to think or say yet about the England Scotland match! What the hell was that? !